Sydney has many beautiful, historic buildings and this week, The Past Present is examining one of the more well known of these – Sydney Observatory. The postcard above dates from the early 1900s and shows the Observatory and the grounds surrounding it. Sydney’s first observatory was established in 1788 by William Dawes at what was then called Point Maskelyne, in honour of the famous Astronomer who supplied Dawes with books and instruments. The name was later changed to Dawes Point. After Dawes returned to England in 1791 the observatory fell into disuse. In 1821 Governor Brisbane built a private observatory in Parramatta, not far from Government house, and after Brisbane left the colony, his astronomical instruments were purchased by the government. By 1847 the Parramatta Observatory was in a state of disrepair. 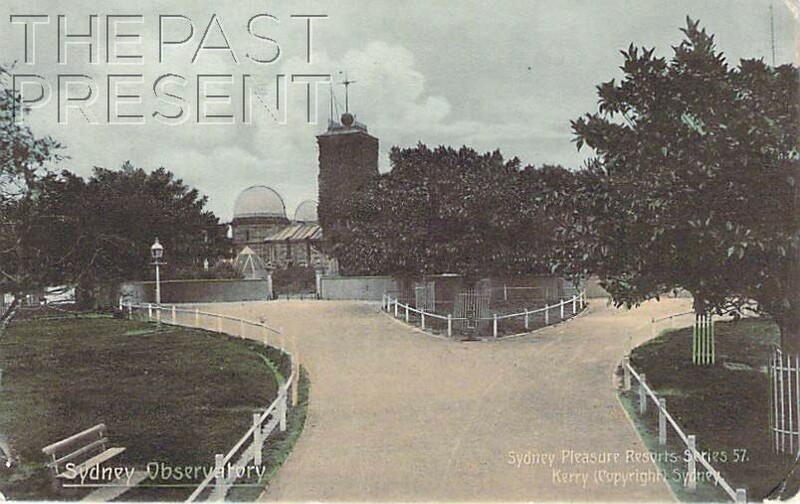 In 1856 Governor William Denison selected what is now known as Observatory Hill as the location for the Sydney Observatory because, standing 40 metres above sea level, it was the highest point in Sydney. Originally, there were only plans to build the time-ball tower, which would drop its ball at 1pm on a daily basis, in conjunction with a cannon fired at Dawes Point to let residents and ships in the harbour know the accurate time. When the observatory was actually built though, the design included two telescope rooms, offices and even accommodation for the astronomer and his family. By 1877 the observatory was in need of extension and a library, additional offices and a third telescope room were added. Sydney Observatory remained in continuous use from the time of its construction until 1982 when ownership and management of the site was transferred to the Museum of Applied Arts and Sciences, now known as the Powerhouse Museum. The postcard above is a glimpse into the early history of Sydney, and of the Australian colony itself. It shows ‘Brickfield Hill’, which was of great importance in building the city. The area is now part of George Street and, as the name suggests, it is a small hill. When the first fleet arrived in Sydney Cove and came ashore they pitched canvas tents which were to provide housing for convicts, soldiers and even storage, but when these tents were pitted against the Australian Summers frequent thunderstorms and heat, they proved inadequate. The colonists tried to build more permanent structures using local wood, particularly Cabbage Palm, but these dwellings had a tendency to warp and rot due to the poor quality, unseasoned nature of the wood. Governor Phillip envisaged a town built of sturdier stuff but unfortunately, he could only find one man, James Bloodworth, skilled in brick making in the colony and at the time, no clay deposits had been discovered. Then, later in 1788, a group of convicts clearing land in the area of what is now Chinatown found deposits of workable clay along Cockle Creek. Bloodworth soon set about establishing two of the important industries of early Sydney, quarrying and brick making, but within a year the easily accessed clay deposits had run out. This forced them to move further up the hill, following the clay deposits. 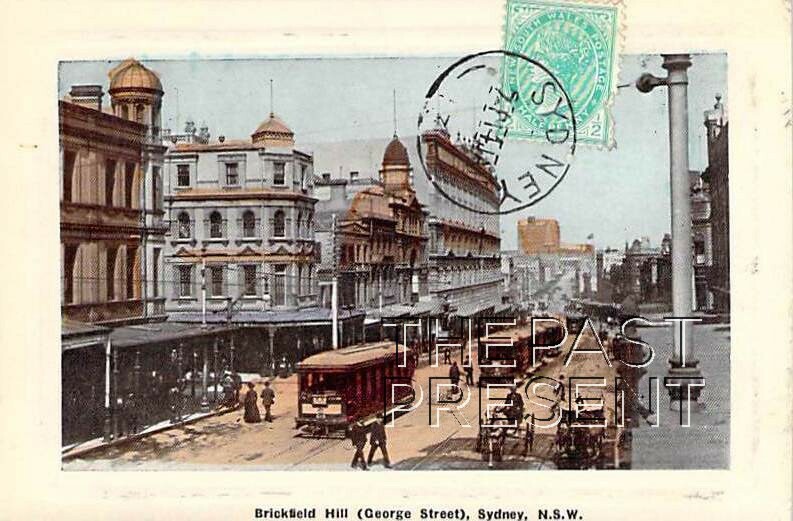 The area became known as Brickfield Hill and historically, the public brickworks were bounded by George, Campbell, Elizabeth and Goulburn Streets. By 1840 the public brickworks were becoming a hindrance to the expansion of the city and a hotspot for crime. In 1841 the Government ordered their closure, but the name Brickfield Hill remained in use. In fact, it was a postal address right up until the introduction of postcodes in 1967! 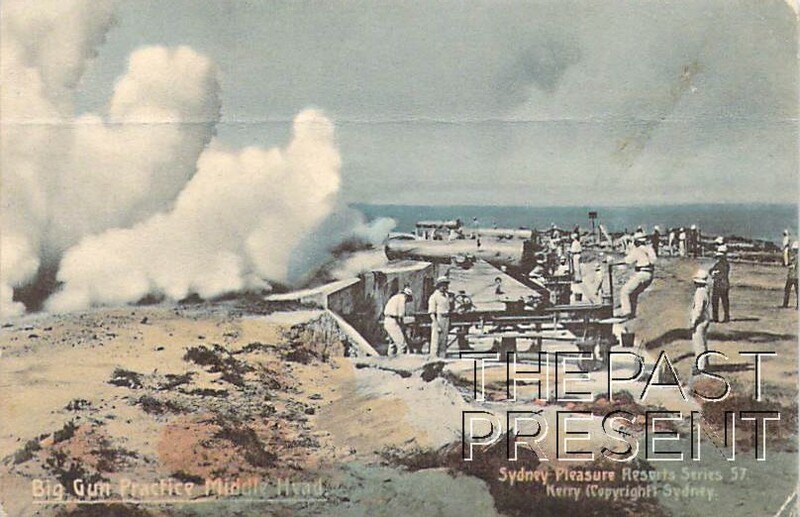 This week, in honour of Remembrance Day commemorations earlier this week, The Past Present is examining a postcard of one of Sydney’s many coastal defences. The postcard above shows ‘Big Gun Practice At Middle Head’ and dates to the early 1900s. It shows troops practicing with the big guns at the coastal fortifications on Middle Head. Early on in Sydney’s history, defences began to be built around Sydney Harbour, mainly to protect against foreign invasion but also to help in case of convict uprisings. Middle Head played a vital role in these coastal defences and in fact the first gun emplacement in Sydney was built at Middle Head in 1801, during the Napoleonic Wars. The main battery on Middle Head was built in 1871 and was designed by the colonial architect James Barnet. The fortifications were in a strategic position and additions continued to be made up until 1911. The aim of this fortification, and of those located on Sydney’s other heads, was to fire on enemy ships attempting to enter Sydney Harbour. Any ship entering the harbour had to go past North, South and Middle Heads and therefore, past the fortifications built there. Although those visiting the site today see some of the fortifications above ground, the area was connected by a system of tunnels and there is a great deal more to the fort than what can be seen from the surface. Some of these underground rooms were even used during the Vietnam War to train troops, including training to withstand torture, interrogation and prisoner of war conditions. In a week when horseracing becomes a national interest, many of our Sydney readers may have visited this historic racecourse. 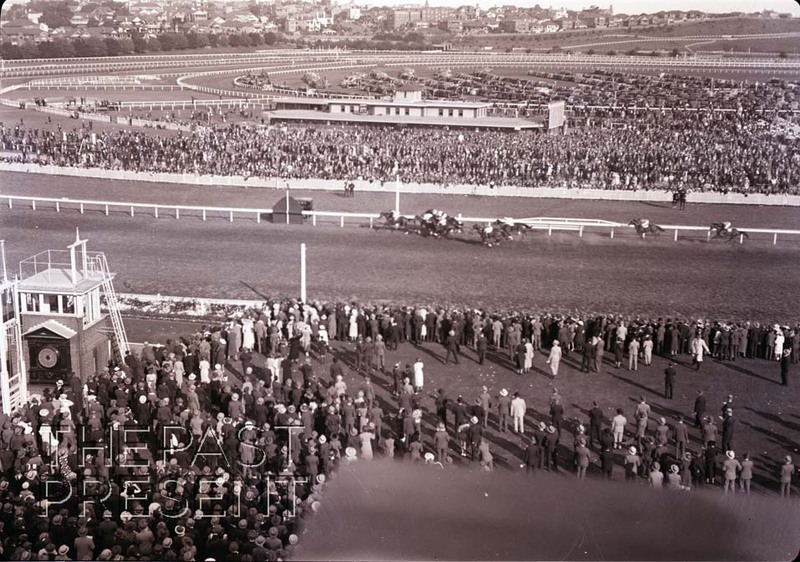 Randwick Racecourse traces its history back to 1832, as we discovered in a previous post, but this week it is the 20th century history of the racecourse which interests us. As the 20th century progressed, greater crowds of spectators, and of course the bookmakers who are so much a part of racing in Australia, attended the race track. 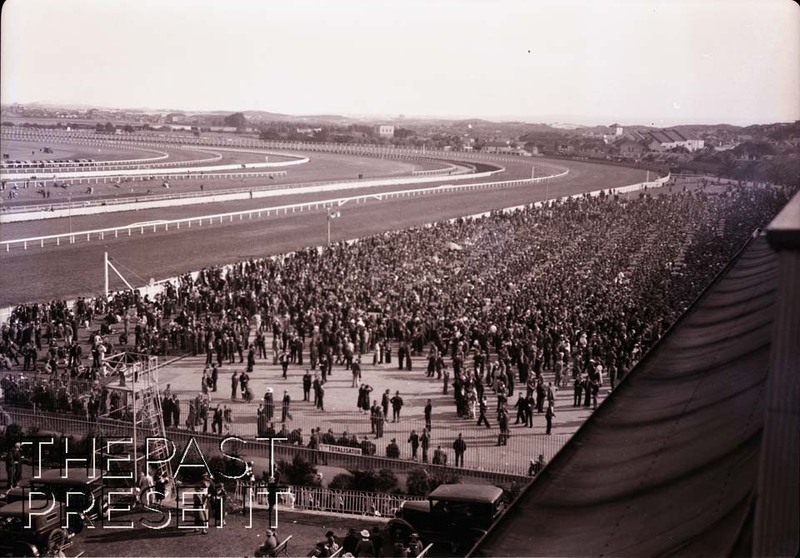 With greater crowds and the funds they bought to the track, Randwick was able to expand and upgrade, with new stands and buildings constructed, many of them in the first half of the 20th century. Robertson and Marks, an architectural firm responsible for many of Sydney’s famous 20th century buildings, were behind the design and construction of many of the buildings, ensuring consistency in style and appearance. As is the case today though, Randwick Racecourse was not just used as a horse racing track, playing host to various other groups and events. During both World War One and World War Two the racecourse was used as a camp for embarking soldiers, with temporary buildings and tents appearing around the site. Charles Kingsford Smith landed his plane, The Southern Cross, at Randwick racecourse in 1928 following his transpacific flight and the area has also been used for concerts, social events and even as the venue for three Papal Masses. This week, with the Melbourne Cup rapidly approaching, The Past Present decided it was time to share one of our shots of Randwick Racecourse in Sydney. This photo, taken by an unknown photographer in circa 1936 shows the finish line of a horse race at Randwick, and the spectators gathered together to cheer the horses on. Although the Melbourne Cup is probably the most famous horse race in Australia, it is certainly not the only horse race, nor is Flemington race course the oldest. Racing had been a popular pastime in early years of the colony and several racecourses had been constructed around Sydney, but by the 1830s they had all ceased operation for various reasons. Hyde Park had therefore remained the main centre of horse racing in Australia, but a dedicated racecourse was needed. In late 1832 a group of gentlemen petitioned Governor Bourke to set aside land near Botany Road, and in 1833, with the land having been surveyed and found suitable, the petition was granted. Racing began at the course, then known as ‘the Sandy Course’ due to the sandy nature of the soil, in Autumn 1833 but by 1838 racing at the course had ceased. Come back next week to find out more about the history of Randwick Racecourse and for another amazing shot from the collection!